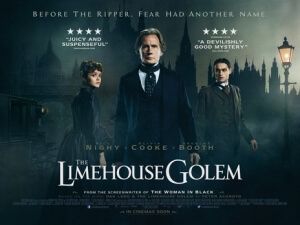 It’s been a good long while since we last had a good old fashioned Victorian-era mystery-thriller in cinemas, and with Sherlock off the airwaves until whenever Benedict Cumberbatch and Martin Freeman next have a free spot in their schedules, the time feels right for something like The Limehouse Golem to come along and satisfy people’s cravings for a dark detective saga. But while it never reaches quite the ingenious heights of some of history’s most famous mysteries, the ride is still intriguing and fun enough to keep you hooked until the final big reveal. It’s 1880, and a series of gruesome murders have rocked the Limehouse district in East London. Inspector John Kildare (Bill Nighy) is brought in to investigate, more as a scapegoat figure for the clamouring press so that Scotland Yard can protect the reputation of one of its leading figures, but he is still able to boil down the list of suspects to four very different, but also very prolific figures; philosopher Karl Marx (Henry Goodman), novelist George Gissing (Morgan Watkins), stage performer Dan Leno (Douglas Booth), and failed playwright John Cree (Sam Reid). Unfortunately, the latter has just been found dead, and his wife – former stage actress Lizzie (Olivia Cooke) – is currently on trial for his murder, which prompts Kildare to discover the killer’s identity in time so he can not only save Lizzie from the hangman’s noose, but also the next victim in the series of attacks by the assailant known in the press as the “Limehouse Golem”. The story’s setting takes place some years before Jack the Ripper enters the scene, but this is the kind of gruesome tale – albeit fictional, as it’s based on Peter Ackroyd’s murder mystery novel Dan Leno and the Limehouse Golem – that, were it real, could have potentially inspired Mr. the Ripper’s wrath on London society, lending it a certain feeling of foreshadowing of much worse things to come. This film, however, is much more concerned with its own serial killer, and the path that it takes in deciphering the clues and narrowing down the small list of potential assailants is incredibly watchable, in a murky and simultaneously camp way. Throughout moments in this film, we see imagined visual representations of the killer’s found diary entries with various suspects enacting them out for us, so we get to see scenes of Karl Marx murdering and decapitating a victim before leaving the head on top of a window sill, and another of them murdering a rabbi, castrating them, and then using their appendage as a bookmark on a page describing the Jewish legend of the Golem. Not only is it a clever way of prolonging the mystery element, but there’s something unexpectedly fascinating about seeing these real figures, especially ones like Karl Marx, be depicted in such a murderous way, even if they are just fantasy sequences. It’s part of what makes the mystery such fun to watch, even though some of the twists (especially the last couple) don’t entirely make sense and some of the character motivations come out of almost nowhere. It is a very theatrical movie, one that delights in entertaining the audience without much reliance on brain power. Fitting then, that the strongest parts of the movie have to do with the sub-plot which sees Lizzie recount via flashback her times as a stage actress, mentored by Booth’s campy interpretation of Dan Leno, whose vibrant and fearless personality just screams “theatricality”. It is in these scenes, as we see Lizzie quickly rise to prominence after taking over from a deceased little person, that the movie puts its focus strictly on the world of the Victorian London stage, and it often feels like a completely separate film from the main one about a violent serial killer, sometimes even a more engaging one. You’re with Cooke’s Lizzie all the way as she encounters one complication after another, including her meeting of the man who would eventually become her husband, and the very reason she is facing death on her trial. This section of the film is filled with such life and interesting characters that you kind of want the whole movie to be more about this, and be a little disappointed when it cuts back to what it originally set out to be. As it is, it’s entertaining enough to make you glad you saw it, and contains a decent mystery to get yourself wrapped into. It’s probably best as a one-off, though, as any repeat viewings may leave it open to be picked apart by its various plot holes, ruining the momentum it worked so hard to achieve. The Limehouse Golem is an entertaining mystery-thriller that keeps your attention for long enough to be mostly satisfying, though it never reaches the creative heights as some other films of its kin.